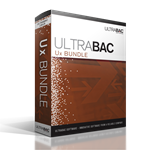 The UltraBac Ux Bundle provides the best all around protection for your Linux server. The product combines the standard backups of UltraBac with fast image disaster recovery. This provides quick file-by-file or bare metal restores at your fingertips. Price includes first year maintenance and support services. A first year Maintenance Subscription Agreement (MSA) is included in the license price. Discounted prices on second year maintenance are also available at the time of your initial purchase. With this annual contract, customers receive priority service and unlimited technical support. Software upgrades are also provided at no charge when downloaded from the UltraBac Software website.